How many boys are prepared to oppose today’s Godless culture? Abortion, unnatural vice, transgenderism and the mainstreaming of satanism are attacking the family. Every Catholic parent struggles to strengthen their children’s faith against the insanity of the world. But how many camps teach young men how to fight the errors of our day and not merely take a defensive position? 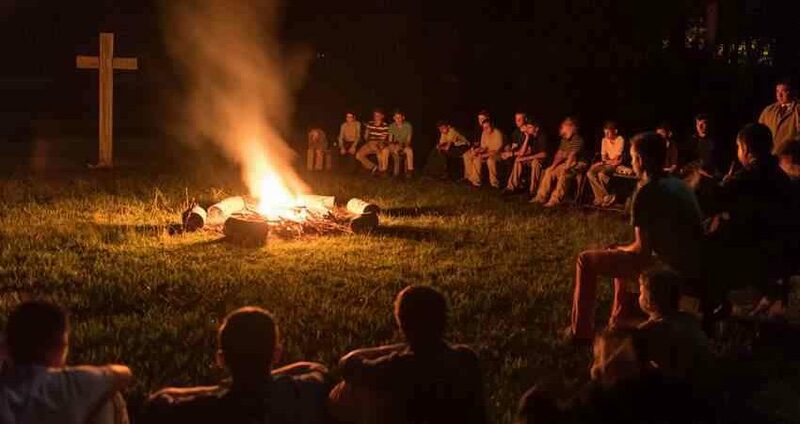 The annual TFP Call to Chivalry Camp in Louisiana teaches boys how to go on the offensive in the spiritual life and become bold defenders of God’s law, while cultivating true devotion to the Blessed Virgin Mary. As a counselor at this 7-day camp, held from June 29 to July 5 in Norwood, Louisiana, I witnessed how a new generation of young men are eager to embrace the Catholic ideals of chivalry and fight for the rights of the Church. Get information about future camps here. To begin, every camp has a historic theme that guides the talks and activities. This year’s theme was Catholic Portugal. One might ask, “Why Portugal?” Because the Catholic history of Portugal is rich. The lives of noble leaders such as Saint Nuno Alvares Pereira, Henry the Navigator, Afonso de Albuquerque and missionaries like St. Joseph de Anchieta inspire. Not to mention Our Lady of Fatima’s apparitions 100 years ago to three shepherd children, when humanity received the greatest message of the century: Pray and convert or expect a severe chastisement for sin. As you drowsily open your eyes, you try to remember where you are. The clock says 7:00 AM and you’re in a bunk bed. Ah yes, you’re at the TFP Summer Camp. You said goodbye to your parents and went to bed, wondering what you would be doing for the next seven days. All at once, there is a racket in the hall: bagpipes and drums play reveille! Leaping out of bed you rush into the hall and line up to pray the Saint Michael Prayer with the other boys. Inspection is next. You are instructed how to make your bed in tight military fashion. After a few push-ups for not getting it right, you are ushered to a formation outside, where all the boys sing the Creed and raise the American flag, the Papal flag, and the lion-stamped TFP standard. Breakfast is closely followed by a talk explaining the heroic virtues of Saint Nuno Alvares Pereira and how one should strive to be like him. Enthusiastic and ready for action, you head out to games. And what games! You’ve never seen the likes of them: dodge ball, shield ball, and capture the flag. Sportsmanly competition abounds and everyone is soon soaked in sweat due to Louisiana humidity, but nobody cares. This is great fun. With rules like these, how can a young Catholic boy not love the camaraderie and friendships that grow on the game field; friendships that will be tempered and enriched in the arduous treasure hunt and obstacle course to come? After another talk in the afternoon, you are informed that Confession is available for those who wish. Dinner is served! It's an excellent Portuguese meal with lamb chops and bolinhos de bacalhau -- codfish with mashed potatoes and spices rolled into balls and deep fried to fluffy perfection. Dessert is pasteis de nata, a crispy mouth-watering custard pastry. The after dinner talk is by Mr. Michael Gorre who comes in with a full pack, rain gear and staff. He tells of his 100-mile pilgrimage, or Camino to Fatima and how difficult it was. You are encouraged to pray the Rosary every day and this is reaffirmed by the evening torch lit rosary procession. And what an honor! You are asked to help carry the statue of Our Lady of Fatima in the procession. She gets heavy, but your spirits are light and you tough it out to the end of the Rosary. Prison break time! Other boys are wildly enthusiastic about it and some even put on face-paint so they can better camouflage themselves in the woods! For those who are not familiar with the game, it’s a hybrid between hide-and-go-seek and manhunt. There are the “guards” who carry flashlights and go around, finding and tagging the “prisoners.” Once tagged, the prisoners hold hands forming a line anchored to a tree or pole designated as the “prison.” You are informed to stay away from the students of St. Louis de Montfort Academy because they are the best guards and can catch you as soon as they look at you. The game ends and showers ensue. "No ticks," thank heavens. Good thing you wore long pants. You lie in bed for a total of 5 seconds trying to remember all the amazing things that happened that day, but barely make it past inspection when you’re fast asleep. We like to show the young men that it's not enough just to have our faith, but that we must go forth and teach all nations. We must stand up for what we believe and consequently defend the unborn. So, every year, we travel to the Planned Parenthood facility in New Orleans to unfurl our pro-life banners. Standing in the heat, we show that we are serious about fighting the Culture of Death legally and peacefully. We pray the Rosary, sing Catholic hymns and urge passers by with our “Honk Against Abortion” signs to show that they care for the unborn too. There’s a steady stream of traffic and also a steady stream of honks. We did get some one-finger insults from pro-death cars, but we smiled and offered up our sufferings to Our Lady of Fatima whose statue was present, blessing our fight. So, come and join us, if you’re up to the challenge. But, make sure you come for the right reason: to strengthen your Catholic faith and answer the Call to Chivalry. Those looking only for fun need not apply. Because this camp is for heroes.